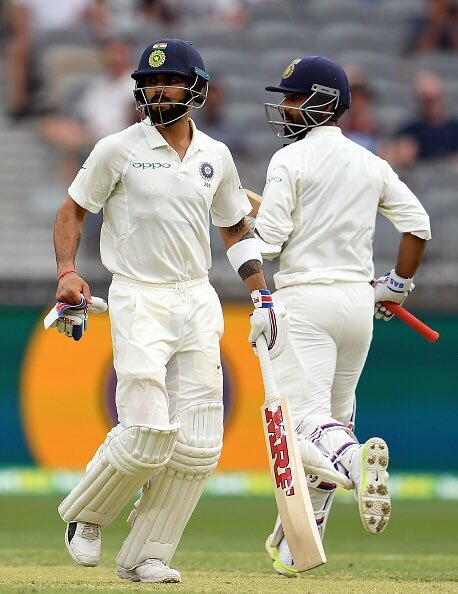 Virat Kohli and Ajinkya Rahane scored brilliant half centuries, as India finished Day 2 of the second test at Perth on 172/3. Australia had started the day on 277/6 and the overnight pair of Pat Cummins and Tim Paine batted steadily and added 33 more runs as India, somewhat surprisingly, chose to begin with the pair of Shami and Ishant Sharma. The introduction of Bumrah and Yadav into the attack immediately changed things, with the latter producing a peach to bowl Cummins for 19. Skipper Paine was the next fall, trapped in the crease as Bumrah pinned him in front for 38 runs. Sharma wrapped up innings by getting wickets of Mitchell Starc and Josh Hazelwood in successive balls, both caught by Rishabh Pant, as Australia were bowled out for 326 runs in 108.3 overs. For Starc, it was a virtual action replay of his dismissals from the first test- caught behind after being lured into the drive. Sharma was also India’s best bowler as he finished with figures of 4/41, while Bumrah and Yadav picked 2 wickets apiece. India’s innings started disastrously, as Murali Vijay was dismissed by Mitchell Starc for a duck just before the lunch break. A fiery Starc delivery found the gap between bat and pad as Vijay’s lean test run continued. Just after lunch, Josh Hazlewood cleaned up KL Rahul with an unplayable yorker. With both openers back in the pavillion and India reeling at 8/2 on a pitch that was offering assistance to the bowlers, the visitors needed their best batsmen to steady the ship, and steady they did, in the face of some hostile bowling. At the start, Virat Kohli took the attack to the Aussie bowlers as they tried to trouble him with fuller deliveries, which backfired as the Indian skipper picked up boundaries with some deft flicks and drives. Kohli and Cheteshwar Pujara showed great composure and application as they added 74 runs for the third wicket, to take India from 8/2 to 82/2 , before Pujara was dismissed caught down the leg side of the bowling off Mitchell Starc for a gritty and a patient 26. That brought Ajinkya Rahane to the crease, and the Indian vice captain again counter attacked, continuing from where he had left in Adelaide. The pair put on an unbeaten 90 run stand, during which Kohli played cautiously and Rahane mixed it up with aggression. The duo never seemed to be too much in trouble, apart from the contest between Kohli and Cummins. The latter was be the pick of the Aussie bowlers, but didn’t have anything to show for this efforts in the wickets column. The duo saw the day through without any further damage by notching up their respective fifties as as India ended another absorbing day of test cricket at 172/3, still trailing the hosts by 154 runs. Given India’s lengthy tail, Australia will fancy their chances of taking a lead if they can make best use of the new ball tomorrow. Australia at Stumps on Day 2- 326 all out- Travis Head 58, Time Paine 38 , (Ishant 4/41, Bunrah 2/53, Umesh Yadav 2/78).